While the market is proliferated with countless Human Resource Management Systems(HRMS), one of the major expectations of start-ups and small and medium businesses(SMEs) from HRMS vendors that remains to be met are all in one automated solutions that enables both the HR department and management to optimise on time, money and resources. However, with Hyderabad headquartered Cloud HR Console in the market businesses might have to look no further. “We provide an all in one solution to the enterprises wherein they can manage employees, payroll and all the HR Processes with just a simple click,” shares Salmanuddin Syed, Founder and CEO-Cloud HR Console. "We provide an all in one solution to the enterprises wherein they can manage employees and all the HR Process with just a simple click"
Targeted at start-ups and SMEs, Cloud HR Console is high-end cloud-based automated software that delivers user-friendly HRMS tools that meet the unique requirements of growing businesses. Created after taking the experience and knowledge of HR practitioners into account, Cloud HR Console attempts to cut down paperwork and increase productivity by enabling users to focus on mission-critical tasks. The Cloud HR Console comes integrated with attendance, leave and payroll modules along with provisions for monetary advances and loan. All finances are calculated while generating the payslips which is a click away. Proved for error-less automated payroll processing, Cloud HR Console has been packed with more unique features that HR department and the management to derive advantage from. One such feature is the Internal Chatting System which enhances communication and collaboration among the employees. Assign tasks easily and track projects with the Project Management. Use the Training Management feature to schedule on-boarding and internal and external training programme with the provision to make assessments. Break Management System is yet another system that enables the managers and HRs to track employees break in and out time. Built with Employee Self Service(ESS) and Manager Self Services (MSS) portals, the Cloud HR Console meets the requirements of the various stakeholders. Access payslips, book a cab for official trips or raise issue or grievances, all through this system. Aforementioned were only a few amongst Cloud HR Console exhaustive list of features. Cloud HR Console is a highly scalable solution that delivers a flexible setup where users can be added as per requirements. Clients can also choose to customize the application for access from anywhere or restrict within specific office IPs. The security framework around the system is robust with security ingrained at every point of entry and exit. In addition, the company also delivers 24x7 customer support along with free training that ensures clients’ with optimized operations. With simplicity, honesty and ‘customers first’ as the core values, Cloud HR Console aims at completely changing the way companies view HR Process. 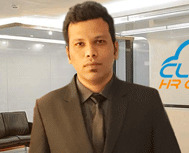 Salmanuddin Syed says, “We want to make the lives of HR professionals easier by automating processes and providing our customers with one-stop solution.” The company is currently gearing up for the release of Applicant Tracking System and Talent Hunt both of which can be further expected to ease up HR operations. The company is also in the process of expanding to US and Dubai markets.